Can someone help me with the following error?? Below is my log and I'm not an expert, so please explain in simple terms! 9/14/2015 18:30:52 PM.100 [NOTICE] DisableNetwork is set. Tor will not make or accept non-control network connections. Shutting down all existing connections. 9/14/2015 18:32:22 PM.900 [NOTICE] DisableNetwork is set. Tor will not make or accept non-control network connections. Shutting down all existing connections. Someone on your network appears to be censoring 4 out of the 5 the default obfs3 Brides that are distributed with Tor Browser. 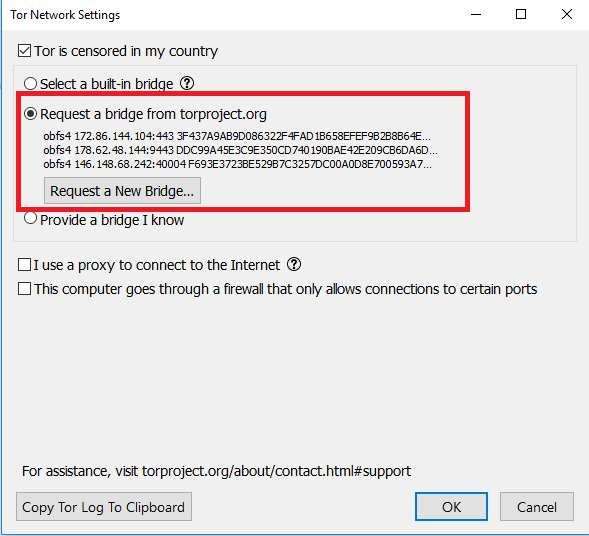 You will need to obtain a different set of Bridges from BridgeDB, and configure Tor Browser to use them (Step 2 and Step 3 from the link, with the corresponding documentation). To resolve this issue, Open Tor browser => Click on Configure button => select Tor is censored in my country option => Click on Request a new Bridge => enter captcha then click Submit. you will get a Bridge as shown in below image. Still, you face connection failure issue try Requesting a new Bridge as mentioned above. Note: You need to download Pluggable Transports, only if you, for some reasons, are using older versions of TOR. In the latest bundles its already inside. In addition to what Yawning Angel already wrote: You should select a pluggable transport like obfs4 from BridgeDB. This method is quite censor-ship resistant and often not blocked. Besides from visiting the website you can also write a mail to bridges@torproject.org from a RiseUp, GMail or Yahoo! address with the subject get transport obfs4. The BridgeDB will send you some bridge addresses. Within the Tor browser you click on the green onion and select the Tor network settings. When you check "My ISP blocks connections …" a submenu will open and you can paste the bridge lines there. Tor Browser will try to use the pluggable transport and you are able to use the net again. Not the answer you're looking for? Browse other questions tagged windows socks proxy or ask your own question. My ISP censors connections and recently, tor doesn't connect. What might be the reason? Why does my Tor browser not run?